Axle: Forged Moser axles with a 4.56:1 ring pinion. Other Specs: Electronic Tilt Steering, CD and Casstte player 4 speaker system. Air Conditioned with Cool Box. Fully Carpeted with Plush seats. Jeep Profile: A 1979 Jeep CJ-7 Originally with a V-8 coupled with a 3 Speed automatic transmission. Chopped and extended by 6" with a metal top, rear sliding windows. Now powered by a Toyota 1KZ-TE, Turbo Charged Electronic Fuel Injection, exhaust gas recirculation system. 4 Speed automatic transmission - computer controlled. 1:4.56 Ring Pinion sporting 31" BFG Goodrich All Terrain tyres. Toyota Landcruiser winch. Quartz Halogen Spot Beams, Hella driving lights, custom aluminum roof rack. Founder Member 4×4 Offroaders Club Karachi. 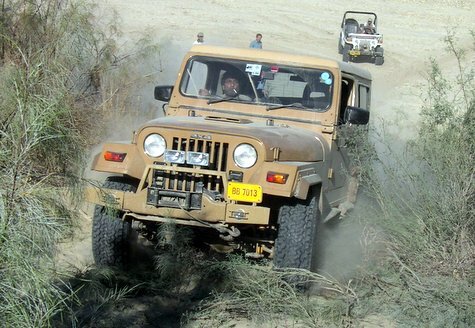 Articles: Previously "Jeep Re-builders" Next "Day Trips from Karachi"
My name is Ahson, and i love jeeps. currently i have a 84 bj-40 in karachi, and at home in islamabad ( where i come from orignially ) i have a willy. i am also the guy who you met while buying energy saver bulbs. i have been trying to link up with some jeep lovers, because for one i dont know too many fun places to go off roading, second i dont wanna go alone incase i get stuck, third i dont have much experience in sand, and fourth i want some guidance regarding setup and repairs. i hope we can catch up sometime and discuss jeep stuff.. my cell # is 0333-2143932. Is it possible to get in touch with you ? I manufacture Genuine Leather Seat covers for automobiles in Karachi. I might get some help in expanding my business in Pakistan. & also the One person who i admire greatly for his extensive knowledge on various thigs... esp jeeps & for his giving me his valuabe time whenever i have needed his help! Thanks to him i've got some very nice childhood memories with him. A great person, im honoured that i know him. Thank you Taimur mamu for all ur support & ur help that uve given to me. I like your jeep. Specs seem interesting. Do check out mine on the mentioned website. Can you recommend which winch would go good with a 1-KZ T? I will appreciate very much. My jeep is built with a 1KZ, plus this engine's original automatic gear box and differentials. It goes from zero to 100 kmph in 14.5 seconds. Have you ever timed yours regarding the compatibility of differentials, gear box etc? keep up the good work!hope to see you again in chitral. Can any one of you send me the exact location of POLDAT on Google Earth. You are reading Taimur Mirza, an entry made on April 27, 2010 by Taimur Mirza, filed under Founder Members. This entry is part of offroadpakistan.com. There have been 11 comments on this entry. The most recent comment is by M Ahsan.